TV personality and English actor Ricky Gervais has joined Ian Somerhalder, Nikki Reed, Gillian Anderson and Australian comedian Meshell Laurie to support Animals Asia’s latest campaign, ‘let a bear sh!t in the woods’. The campaign, developed by Newcastle communications agency Enigma, highlights the plight of around 10,000 moon bears currently confined to horrific cages on bear bile farms throughout Asia and not able to run wild as nature intended. 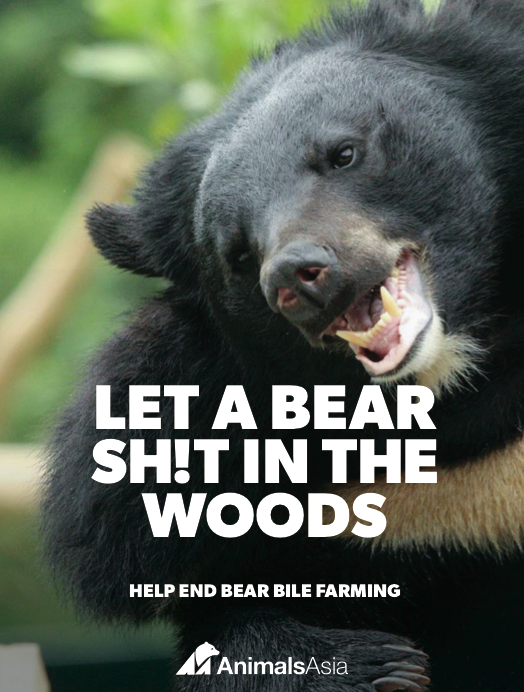 Enigma’s Group Creative Director Brian Daly said the ‘let a bear sh!t in the woods’ campaign asks people around the world to stop bear bile farming. “The behavior we identify as fundamental to being a bear has been taken away from these animals in a most cruel act,” Mr Daily said. “Let a bear sh!t in the woods is the ultimate goal of Animals Asia, to allow these bears to live in their natural habitat and express their natural behaviours. The campaign has been endorsed by Vampire Diaries star Ian Somerhalder plus Twilight stars Nikki Reed and Kellan Lutz. They are also joined by actors Kristin Bauer van Straten, Gillian Anderson and Alicia Silverstone, musicians Matt Sorum and Peter Northcote, entrepreneur Russell Simmons, chef Simon Bryant and comedians Meshel Laurie and Ben Elton. True Blood’s Kristen Bauer van Straten is dedicated to the campaign and helping eradicate bear bile farming within Asia. “Bear Bile farming should be something out of a horror novel, but it’s unfortunately not fiction, as hard as that is to believe,” Bauer said. “Bears are held in metal cages their entire lives with tubes stuck in to their bodies to drain the bile from their gallbladders.